On September 18, 2016, the Reserve Bank of Australia ushered in a new governor, in the form of Philip Lowe. It been the deputy governor for several years and has worked at the RBA all his professional life except for a short stint with the Bank of International Settlements. He speaks Central Bank-speak. On September 22, 2016, he appeared for the first time as governor before the House of Representatives Standing Committee on Economics and delivered the RBA Annual Report 2015 to Parliament. His – Opening Statement – and the subsequent answers to questioning by the House Committee members were revealing because they indicated that the new governor clearly understood the vexed situation that the government had placed the central bank in over the last decade or so, but, at the same time, indicated he was also prepared to continue perpetuating neo-liberal myths that have created the vexed situation in the first place. Not a great start in my opinion. The full transcript of the hearing is available in the Parliamentary Transcript. First, let’s consider what he said that was correct. The story on income growth has been less positive, with growth in nominal GDP being disappointing. Over the past five years, nominal GDP has increased at an average rate of around 3 per cent per year. To put this number in context, between 2000 and 2007, nominal GDP grew at an average rate of 7½ per cent per year. This is quite a change. It goes some way to explaining the sense of disappointment in parts of the community about recent economic outcomes. The following graph depicts the dilemma that the government has created due to its mismanagement of fiscal policy. 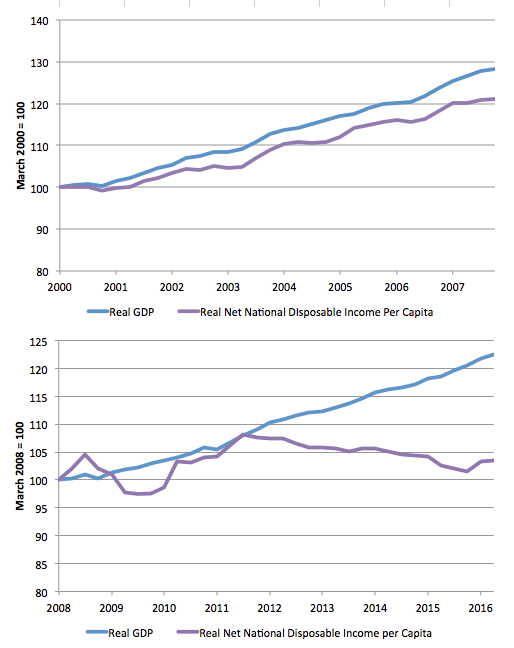 The upper panel shows the indexed movement of Real GDP (March-quarter 2000 = 100) and Real net national disposable income per capita both indexed to 100 in the March-quarter 2000. Over that period, Real GDP grew by 28.4 per cent overall, while Real net national disposable income per capita grew by 21.1 per cent. A broader measure of change in national economic well-being is Real net national disposable income. This measure adjusts the volume measure of GDP for the Terms of trade effect, Real net incomes from overseas and Consumption of fixed capital. So in this first period, on average national well-being was growing, more or less, in line with output growth. However, in the second period (lower panel), which starts with the March-quarter 2008 and finishes with the June-quarter 2016, a major dislocation has occurred between the movements of these two series. Real GDP grew by 22.4 per cent over this period, slightly less than the earlier period shown, whereas, Real net national disposable income per capita grew by a measurable 3.5 per cent. And after reaching a peak in September-quarter 2011, Real net national disposable income per capita has been steadily declining (4.3 per cent on the peak). In other words, Australians are on average worse off than they were in the September-quarter 2011 despite the ongoing output growth. We have been producing more each year but earning less. The main reason for the weak income growth over recent times is the large fall in the prices received for our exports. Since the September quarter 2011, export prices have fallen by around one-third. A second factor that has weighed on growth in nominal GDP is the slow rate of wage increases. This is a common experience across most industrialised countries at present, even those with strong employment growth. In Australia, the current rate of wage growth is the slowest in around two decades. This has been a characteristic of the neo-liberal period as governments of all persuasions attacked the capacity of workers (particularly, through their trade unions), to maintain wages growth commensurate with productivity growth. If you are interested in the entire presentation that the Governor made to the Parliamentary Committee then you can go to the original source. The interesting part of the appearance came in the question and answer section and you can find the full account in the Hansard link provided above. He was asked to comment on the recent “employment growth that was greater than anticipated”, which was a question from the Chair who I discussed in this blog – Don’t let neo-liberal (idiots) loose with a spreadsheet! – where the title should provide you with a guide on how much economic understanding he has. The question was clearly designed to give the impression that government policy was somehow producing robust labour market outcomes. One of the things we are seeing is very, very strong growth in part-time employment whereas growth in full- time employment is relatively weak … I suspect that the labour market is not quite as strong as the headline unemployment rate data suggests because the jobs growth is not in full-time employment, it is predominantly in part-time employment. So there is probably a bit more slack in the labour market than suggested by the unemployment rate. While the Governor adopted a cautious approach to these trends (claiming they were part of a “very positive story”), the fact is that the “bit more slack” is at least 15 per cent of the available and willing labour force. The combination of unemployment and underemployment is at least that. If you add in the fact that the participation rate is well below the November 2010 peak, which means a significant number of workers have stopped looking for work given the very flat employment growth over the last two years, then that degree of slack is even greater. As you would expect, a bit later in the proceedings, the discussion turned to whether “we are beginning to run out of policy options” (a statement from a Committee member), in the face of a declining “appetite” for fiscal policy and the “sluggish growth” in the international setting, which threatens Australia with a recession. The global sense is that monetary policy is not working as effectively as it might have in previous years. I think there are three possible responses to that. The one we have been doing is to just do more monetary policy: if it is not working, do a bit more until it does work. This is why we have found ourselves in some countries with interest rates in negative territory and unprecedented balance sheet expansion. You can keep doing more of something in the hope that it finally works, and my judgement is that that has not been particularly useful. That is one option. Another option is for some entity in the economy to use the low interest rates to increase its spending. The reason why monetary policy is not working globally is that no-one wants to use the low interest rates to increase their spending. Some entity could do that. Governments are one entity, but governments typically do not want to do that. One thing that I find attractive is the idea that government uses either its balance sheet or its planning capacity to do infrastructure spending, not more recurrent spending. We do not need that. If someone in the economy can use their balance sheet to build assets within a rate of return greater than two per cent, that is another option. At that stage, I believe the Governor fell into the neo-liberal Groupthink speak. First, the logic that monetary policy is the only counter-stabilisation tool that is prudent to use is straight out of the Monetarist handbook. It is clear that the Governor realises that even though his first paragraph criticism of the concept is rather muted. Second, some sector has to spend more than it has been for the economic growth rate to increase. In aggregate terms, there are only two sectors: (a) the government sector; (b) the non-government sector. If the non-government sector (households and firms and external) is currently not willing to spend more then there is only one other option – the government sector has to spend more. The governor is correct in saying that low interest rates per se, which are the policy tool that the central bank can manipulate as part of its monetary policy stance, will not stimulate an economy if they do not induce more borrowing and hence greater spending. The private domestic sector in Australia is currently unwilling to expand its borrowing because households are already carrying record levels of indebtedness and have adopted a cautious approach to consumption (not to mention the stagnant wages and incomes noted above) and the firm sector are unwilling to expand rates of investment if consumption growth remains at their current levels. Which leaves the government sector square in the frame. But here we encounter the neo-liberal hype. This manifests in two ways. That a currency-issuing government, such as in Australia, needs to borrow in order to spend. That is clearly false. So the reason that the Australian government is not taking responsibility in the way the RBA governor might like to is not because it’s not borrowing enough, but, rather, because it’s not spending enough. The focus then has to be on why it is unwilling to use its spending capacity to stimulate a failing economy. The second neo-liberal manifestation is the RBA governor’s claim that the increased public spending should be confined to “infrastructure spending, not more recurrent spending”. Recurrent spending is typically defined as that spending which exhausts its benefit within a current fiscal year (more or less). Infrastructure spending or capital works then delivers benefits over a longer an extended period. This distinction came up several times during my discussions with people at the Post Keynesian conference in Kansas City recently. The standard ‘Keynesian’ position is that a government should endeavour to balance its recurrent fiscal position (that is, ensure recurrent spending is equal to taxation revenue within the particular year) and then borrow to ‘fund’ a deficit on the capital account as long as there are projects which will deliver a positive rate of return. We don’t have to get sidetracked here by what constitutes a positive rate of return in the context of a public infrastructure project. Clearly, what is included in the costs and the returns of a public infrastructure project will be quite different to the same elements that are private sector firm will consider. There is no valid comparison between the investment calculus of a currency-issuing government and that of a private, profit-seeking firm. The point I always make is that the distinction between recurrent and capital accounts, which goes back to Keynes himself, is not only artificial but likely to distort our understanding of the benefits of government spending. For example, is it reasonable to assume that the spending that funds the salaries of teachers in the state education system produces benefits that exhaust within a single year? Clearly, a well resourced education system with well-paid teachers delivers long-term benefits to individuals and society in general. These benefits include higher future productivity growth and enhance social stability, to name but a few. There are many more examples of items of public spending that are artificially accounted for as recurrent, which, in fact, deliver long-term benefits. Modern Monetary Theory (MMT) proponents thus do not make this distinction and argue that governments should fund elements according to their contribution to the well-being of the nation and the individuals that live in it. In this context, I wonder what the RBA Governor has to say about the need for the federal government to dramatically increase the unemployment benefit, which has lagged behind other income movements within the country for many years and have forced recipients to live below the accepted poverty line? While it would be better for the government to increase jobs, in lieu of that there is a desperate need to increase the unemployment benefit, which in accounting terms, would be classified as recurrent spending. Third, the RBA Governor implies that public and/or private sector investment projects should deliver at least a return equal to 2 per cent. While that might be the appropriate commercial threshold for a profit-seeking investor, it is largely irrelevant for the public sector, whose charter is to advance well-being rather than deliver monetary returns benchmarked at commercial rates of return. But the inference here is that monetary policy will always be ineffective if, given the current behaviour of the non-government sector, fiscal policy is too tight. Quite apart from the discussion about functional finance and the freedom that governments have to spend without borrowing, that is effectively the point that the RBA governor is making, although you have to listen hard to appreciate that. I considered that issue in the recent blog – Monetary policy has to work hand-in-glove with fiscal policy to be effective. What you are saying is intensely logical — in an era of low interest rates; in a year of searching for increased productivity; that the win-win from infrastructure investment is massive — but you are also regularly asked at these hearings about the public sector debt levels and the need over the medium and long term to reduce that. There is obviously good and bad debt. How does a government borrow to invest in productive infrastructure and survive the ire of the ratings agencies? This is the sort of rubbish that we have come to expect from our so-called party of the workers! As my current book project is revealing, it was the left that embraced Monetarism first and in many cases have overseen the delivery of growth-sapping austerity. Reread the question and all the neo-liberal rubbish is there. 1. Governments should borrow when interest rates are low. Why? A currency-issuing government does not need to borrow at all and when it does is really just dishing out corporate welfare. A progressive position would never entertain the notion that a currency-issuing government should borrow. 2. There is no such thing as “good and bad debt” when it comes to the liabilities of the currency-issuing government as long as those liabilities are denominated in the currency of issue. Such a government can always service its liabilities. 3. Introducing the ratings agencies as some sort of credible constraint on the capacity of a currency-issuing government to spend, whether it be for ‘recurrent’ purposes or for investment in productive infrastructure takes the public debate down a dead end. (a) Ratings firm plays the sucker card … again. (b) Time to outlaw the credit rating agencies. (c) Ratings agencies and higher interest rates. The RBA governor’s reply was revealing. Neo-liberal to the core. He complemented the question “That is a very good question”. That is a very good question. It largely depends upon the story that the government has around what is being done with the money. If governments are borrowing to fund recurrent expenditure, it is hard to have a good story. I do think we need to be very disciplined about borrowing to fund recurrent expenditure, because ultimately that does have to be paid by somebody. It is going to have to be paid by our children or us later in our lives, but probably by our children, and there is a question about whether that is the right thing to do. If we keep on borrowing to fund recurrent expenditure, then essentially we start to lose our insurance, and we do not have very much insurance against something going wrong, because we will have done the spending and if we need to increase spending in a downturn the debt levels will already be high and we will not be able to borrow that much. This is what happened in Europe. How many errors can you find in that sordid little paragraph? 1. A currency-issuing government effectively just borrows back net spending from previous periods. The net financial assets created by past deficits are held by the non-government sector in a variety of forms and bondholders just swap liquid forms of that wealth for an interest-bearing asset that is called a government bond. 2. The idea that the spending capacity of a currency-issuing government is constrained in some way by the particular level of public debt and/or fiscal balance is erroneous. Such a government can always increase its net spending (that is, its deficit) any time it chooses and successfully purchase any idle real resources that are available for sale in the currency the government issues, irrespective of its current fiscal position. It is a lie to say otherwise. 3. Should the private investors find it not commercially attractive to swap other forms of wealth in their portfolio for government bonds, then the government can always sell the debt instruments to the central bank, or, preferably break the practice of matching deficits with bond issuance. The private bond markets can never constrain the spending of a currency-issuing government. Never! 4. The inference that “what happened in Europe” is applicable to a currency issuing government is another lie that frequently is used in public discussions to scare people into believing that Australia is about to become Greece and therefore should engage in austerity. What happened in Europe (specifically, the Eurozone) has no applicability to the options facing the Australian national government. The Member State governments within the euro zone use a foreign currency and interact with an alien central bank. Conversely, the Australian national government issues its own currency and at any time it chooses can instruct the RBA to credit relevant bank accounts to facilitate its spending plans. Only ideological constraints would prevent the national government in Australia from exploiting its full capacity as the currency issuer. The RBA Governor knows that but chooses to parrot the ideological ravings of the dominant neo-liberal Groupthink. I think we need to be very disciplined about recurrent expenditure. That does not mean that you cannot simultaneously borrow to build assets. That is what most businesses do; they meet their ongoing costs through their revenue flow and they borrow to build assets. So the test is: can the government, can any of us find assets to build that generate a return for society? If you can do that in a structured, disciplined, rigorous process with good governance, I am hopeful you could have a conversation with the rating agencies about that—but whether you could convince them, I do not know. One of the worst metaphorical claims used by neo-liberals to place restrictions on what currency-issuing governments can do is to invoke the government is like a household analogy. Another, is to invoke the government is like a business firm analogy. So-called progressives often fall into this trap, thinking it is a way to trump conservative arguments against public infrastructure spending. So they think it’s smart to say well if the corporate sector can borrow to invest in projects using some rate of return calculus then why is not appropriate for the government to do the same thing. The simple fact, as noted above, is that the decision-making that a profit-seeking business users to determine whether it is appropriate to invest in a particular project or another, is largely irrelevant for public sector infrastructure decision-making. First, the private sector entity has to borrow if it is to spend more in any particular period that its income. Such an entity is thus financially constrained in its spending. Second, its charter is to deliver monetary returns in the form of profits to private sector investors. Its concern is to, thus, choose projects whose private costs are less than private returns, taking into account the costs of borrowing. Third, a currency-issuing government is not akin in any way to that sort of private, financially-constrained entity. That is not to say that the government should not be aware of the real resource costs that are incurred for any particular public project. It is also not saying that the government should not be aware of the social benefits of a particular project relative to another possible use of those real resources. Fourth, worrying about whether the government gets a tick from the credit rating agencies indicates a complete lack of understanding of the powerlessness of those agencies vis-a-vis currency issuing government. The RBA governor was specifically asked “why our credit rating matters to us as a nation and what is the impact on consumers if it changes”. The main impact of a changing credit rating would be on the interest rates that the government pays on its debt and that banks pay on their borrowings, but the effects are fairly small. For the type of credit rating changes that we might face, the effects on borrowing costs are quite small. I just have to draw to your attention the experience of the United Kingdom recently. Their credit rating was downgraded, and the week that that happened their borrowing costs fell quite a lot, because there are lots of other things going on. The markets have already made their own judgements about what type of credit premium they need to get to hold any particular debt obligations. So I do not think the effect is overly material. First, the government can always control the yields it pays on debt issued if it chooses. The credit rating agencies have not capacity to alter that if the government chooses otherwise. If the government bends over and says to the bond markets that the credit rating agencies are credible and we will not interfere in the bond auction process (that is, take a position on the demand side) then the ratings might matter. Second, the RBA governor clearly understands that even within the environment where governments unnecessarily match their deficits with bond issuance, any downgrade by one of the corrupt credit rating agencies will have minimal impacts anyway. Not a great start from our new central bank governor. We need to move towards an understanding between the central bank and the treasury parts of government that all these neo-liberal myths are detrimental to good policy-making and advancing the well-being of citizens. That understanding should include the introduction of what we are now calling Overt Monetary Financing, which will do away once and for all with the hoopla of bond issuance (corporate welfare) and prioritise spending initiatives (whether they be recurrent or capital) which advance well-being and are consistent with the availabile real resources. If the first appearance of the new RBA Governor is anything to go by then we are light years away from that progression. Surely the response to this is to get off the ‘spending’ side of the argument and switch to the ‘buying’ side of the argument. If the government fails to do ‘recurrent expenditure’ to purchase the element that is currently un-bought in the economy, who else do you propose is going to purchase the element and what with? Similarly on the ‘investment’ side, why is direct investment required, rather than purchases on ‘recurrent expenditure’ items that induce indirect investment or greater amortisation of existing assets across more units within the non-government sector. Particularly when the economic units required to construct infrastructure are already fully bid by the non-government sector. Both the arguments for direct investment only and against recurring expenditure are incredibly primitive. The highest private debt in history, flat lining income, small houses selling for two and a half million, and plans to balance the budget; what can go wrong? Maybe Deutsche bank? Central bankers don’t get their jobs unless they are part of the City’s team. Where do you get that figure? “If the government bends over and says to the bond markets that the credit rating agencies are credible and we will not interfere in the bond auction process (that is, take a position on the demand side) then the ratings might matter.”- hopefully this never happens.i can envisage a right wing govt forbidding its CB from intervening to justify austerity and borrowing costs rhetoric. You cannot get a job at the RBA unless you are a Neo-Liberal. I don’t understand why anyone is even remotely surprised by the new governor’s ignorance. Another excellent blog, an intellectual breath of fresh air. To what extent is the RBA “independent” of the Government / Treasury – in comparison, say, to the BoE, or the pre-ECB Bundesbank? that the levers they are pulling are not working. Hopefully neoliberalism will drop off the perch soon! The RBA board is appointed by the Treasurer. So hardly independent. The Reserve Bank Board comprises nine members: three ex officio members – the Governor (who is Chair), the Deputy Governor (who is Deputy Chair) and the Secretary to the Treasury – and six non-executive members, who are appointed by the Treasurer. The Governor and Deputy Governor are appointed for terms of up to seven years, and are eligible for reappointment. The non-executive members are appointed for terms of up to five years. There is no limit on the number of terms a member may serve. A list of previous and current members of the Reserve Bank Board is also published on this website. In terms of section 17(1) of the Reserve Bank Act, members of the Board may not be a director, officer or employee of an authorised deposit-taking institution for the purposes of the Banking Act 1959. There is also the fact that while full employment is part of the RBA’s charter they abandoned the idea many years ago. And a quick look at the RBA boards over the past 20 years or so tells the story why – No representation for workers, children, education, indigenous Australians.. and so on. Plenty of representation though for Financial institutions, Super Annuation funds, mining / resources…. and all the other usual suspects. think they are at stage one , if that bob.